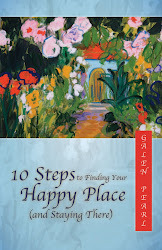 10 Steps to Finding Your Happy Place (and Staying There): Get Over It! After reading your post it too a few minutes before I could compose a clear thought. As I read your story I was thinking how hard it is for me to let go of something small like a conversation I wish had went in a different direction. It will play back in my head for days on end. Thanks for the reminder I need to work a little harder on letting go. Bonnie, You and me both. We'll work on it together. Thanks for your comment. How did you know I needed to hear this? I've been upsetting myself today with angry and resentful thoughts about situations gone by and situations that might never even happen. Such a waste of time and energy. I need to get over it! Thanks as always for sharing your journey. As you do, you help others! Tina, I suspect that many of us share this tendency to dwell on something that is long gone or uncertain in the future. As you observed, it does drain our energy, and our peace and joy. I'm going to try to remember Joel's simple directive. Thanks for your comment. I love that Joel Osteen guy Galen. He always simplifies life problems and breaks it down to the bottom line. Also so inspiring - it doesn't happen to you but for you. wow!!! Pitiful or powerful. another wow. he hits us with so much wisdom and encouragement with such a simple sounding and easy to understand sermon. And of course I randomly walked into the bookstore on Thursday and picked up the book of the man you showed a video of and read about an hour's worth of it - Nick Vujicik. I was blown away and realized if he's making do without his arms or legs, I could get over whatever problem I was dealing with. Vishnu, Yes, Joel has his moments, that's for sure. This sermon was full of them! Now I'm intrigued by Nick, too. I see that there are lots of videos about him on YouTube. I included a short one with this post, but there are longer ones, too. I might try to watch one today. And I will definitely check out his book. Thanks for commenting. The book, the 50 pages or so Iread was nothing short of amazing. I realized I have no problems in life after reading about his life and challenges. He gives us a great dose of perspective! Harleena, So true. I'm going to remember to watch one of the videos about him next time I'm obsessing over something petty. Thanks for your comment. I love it when the answer we need, or the guidance, appears at the perfect time. Lovely post, and something I needed to read... Thank you. Teresa, Glad it was timely for you, too. Thanks for your comment. Have you ever read Illusions by Richard Bach? I think you might like that one :) I'm glad you got your message. Cairn, I'm not familiar with it, but I will check it out right away. Thanks for suggesting it. I'm glad I got my message, too. I woke up feeling free this morning! Thanks for commenting. Pam, I'm glad this message was helpful to you. Joel's sermon will repeat this evening. Maybe it will air where you are and you can watch it. Check your local cable listings. Your example in your own life is inspiring. Thanks for sharing it. Jedidja, Glad you liked it. Thank you for sharing this story and how you overcome the difficulty you faced! I can definite relate to having experiences like the one you had, where they just bug us and are difficult to shrug off. I've been trying to apply the concept that everything I'm experiencing, whether good and bad is exactly what I'm meant to be experiencing. In this sense, I can just accept it and as you said, get over it! I have to confess. Every so often I too also watch a preacher on TV! The video you shared by the way, as amazing and very inspiring. Thanks, Galen. Hiten, Our secrets are coming out! And thanks for sharing your technique. That is very helpful to suspend our judgment of something as good or bad and accept it as is. Tara Brach wrote a wonderful book called Radical Acceptance. It's very much in keeping with what you described. You might like the book. Thanks for commenting. How can this be the message you needed to hear and your followers who left comments before me needed to hear when so clearly this message and post was meant for ME? Thank you. Thank you. Thank you. Time for me to get unstuck. Kim, Ha! I can see that I'm in great company. I'm happy to share this "personal" message with you. Thanks for your comment. I've often had a similar experience, Galen, where I needed to hear something and I'd get it from an unexpected source. "Get over it" is a message one can receive with an open mind only if they're ready! Corinne, I was certainly ready because after hearing that message I felt so free. I woke up today feeling peaceful and happy. It's interesting that you have had this experience, too. I think if we can pay attention, the help we need will always be there. Thanks for your comment. Thanks for passing on this message to a non-TV-preacher- watching person who occasionally needs to be reminded that this is so true. Tom, The message might have come from a TV preacher, but it certainly extends beyond any religious doctrine. Glad you found it helpful. Thanks for your comment. I too have 'gotten over it'. I've gotten over what people say and do. I've gotten over the hypocrites and nastiness of the world. Once I did that, I realized how blessed I really was. Joel Osteen does it for me each and every time. Mrs. SP, So glad you have "gotten over it" in your own life. Seems that I need a reminder now and again. Also glad to meet another Joel admirer! Thanks for your comment. It seems to me that "letting go", otherwise known as getting over it, is a very good and necessary thing to do to go forward in life! Lori, I do love it when that happens! And yes, letting go and getting over it are very similar. I think yesterday I needed to hear it in a stronger version. Thanks for commenting. I think any form of Letting Go is an art to be practiced. I remember in my college days reading a book about One does not need to know what the other feels or thinks about you - truly that is their business and since the mind can change so easily - it is more important to figure out what you think about something and then change your mind or get over it. Much easier said then done for me. Patricia, I agree that this is something that can be practiced. The book you mentioned sounds intriguing! Thanks for commenting. Galen, add me to the group of those thankful for this timing. This is the third sign I've gotten today that tells me it's time to let go of something that has been bothering me. It's not always easy but sometimes we need to put our own selves first, our well being. Forgiveness does not mean allowing bad behavior or treatment or forgetting but wishing for the other person to have a softened heart and for peace in our own minds and hearts. Bernadette, That is a wonderful description of forgiveness. You are right that it does not mean being a doormat or letting someone abuse us. Good boundaries are compatible with forgiveness. Thanks for adding your comment to the discussion. I just love it when things like this happen - we so need a message and "BAM!" there it is! Just like that! Wonderful post, Galen, and certainly one which made my heart sing today. Martha, BAM is right! It was pretty amazing. What's even more amazing is that the effect has stayed with me. It really broke the hold that I had on that situation. Thanks for your comment. Your post today is so wonderful -- and so true. If we don't get over past pain, we allow it to continue to hurt us. It's so sad to see people whose lives are limited by pain of the past and tinged with residual bitterness. Choosing to let it go and get over it is so life-affirming. Thanks so much for the reminder! Kathleen, We can hold onto a recent "wrong" for days, and to a past one for decades. It's all the same isn't it? We are chained by our own bitterness. I have felt so free since my "epiphany" yesterday! Thanks for your comment. The first step to that is being self-aware and accountable. Dawn, Well said! And thanks for pointing out that essential first step. As long as we are blaming someone else, we will never free ourselves. Thanks for commenting. You always inspire me with your thoughts. It is interesting because I had a smiliar moment when I was struggling with something and I started to study and there was the answer. I do call in prompting and inspiration. It became part of my post today. I just love reading your thoughts because you have great thoughts that inspire. I like the idea of just get over it. I need to do this with some of my relationships. LeAnn, You are so sweet and generous with your kind words. Sounds like we are in sync today. I'll be right over to read your post. Thanks for your lovely comment. Great post, Galen. What three wonderful words to remember when I think it is all about me and all about my issues...GET OVER IT! I read something by Joel almost daily and I need to thank you for reminding me to eliminate some of the "trivia" in my life that feels so "heavy" because I won't let it go. Kathy, I might write these three words on a sticky note where I can see it all the time! Glad you liked the post. Thanks for your comment. "we can be pitiful or powerful." Katherine, I had a great image of breaking open a fortune cookie and finding the little piece of paper that says "Get over it!" Ha! Thanks for your comment. As always, well timed. I don't fester too long when I have something eating at me. I do fester, but after a while I feel it draining my energy and realize I have to move on and just get over it or just do it. It's not always easy, but I get there in the end. brenda, I used to be a major fester-er, but not so much anymore. That's why this conversation and my obsessing over it was making me a bit crazy! I'm glad Joel stepped in at just the right moment. Thanks for your comment. Freedom! Galen, Your blog has been doing wonderfully! Your post are well written relateable and to the point. Your readers love you! I love coming here and seeing such a long list of comments! Jodi, Wow, thank you for the very kind words. I'm grateful that readers with very different backgrounds and perspectives feel comfortable and welcome here. I always appreciate the comments! Including yours--thank you! Hanging on to negative stuff only brings you down. I have a friend that has a hard time letting go of our old work place that she has not been at for almost 3 years. I have been back twice, but have no intentions of ever going back if they asked me. It was a very negative place and she just doesn't seem to want to let the injustices done left to rest. But I just let her talk, somehow it helps her to vent. Today she called and mentioned very little about it, I guess that is a good sign. I had to learn to let a lot of stuff go. It destroys your spirit if it doesn't also ruin your health. I had watched that video before...it makes our problems seem quite irrelevant in comparison to what he has to deal with on a daily basis. Thank God I have arms that sometime ache, thank God I have legs that sometimes hurt.